Having twins puts an unexpected strain on our bodies. We’re not really designed to have more than one baby at a time, and it’s amazing that we really can. Your twins really are miracles, in more ways than one! So when you’re having twins, it’s incredibly important to keep yourself as healthy as possible, and one of the major things that contributes to the health and comfort of you and your babies is your diet. So read on to find out what to eat when pregnant with twins, and any other considerations that you might not have thought about. Does Your Pregnancy Diet for Twins Need to Include More Calories? The experts say yes. Apparently, you should be eating around 300 more calories per day in the first trimester, 680 calories in the second trimester, and 900 calories more in the third trimester. But it’s also incredibly important to track where your calories are coming from. Not eating the right things leads to the cravings that pregnant women have, and your babies need specific things to develop correctly. Try and get around 50% of calories from carbs like sweet potatoes, brown rice and oatmeal, 25% of calories from proteins like chicken and fish, and 25% to 30% of calories from fats like cheese, milk, eggs and oils. Moms with twins are at an increased vulnerability to gestational diabetes, so it’s worth steering clear of white carbs as much as possible. Things like white bread, pasta and white rice are surprisingly high in sugar and can contribute to the causes of diabetes. You should be aiming to eat as healthily as possible, so follow good health guidelines, and as much as possible follow a balanced diet. What About Specific Vitamins and Supplements? We’d recommend a prenatal vitamin to every expectant mother, and if you’re having twins you don’t need a specific type of vitamin. A standard prenatal vitamin will do the job. As always, talk to your healthcare professionals if you’re worried, or just want specific recommendations. As we always say, every pregnancy is different, especially with the different twin types. But if possible, look down this list and check off whatever you can, as much as you can. 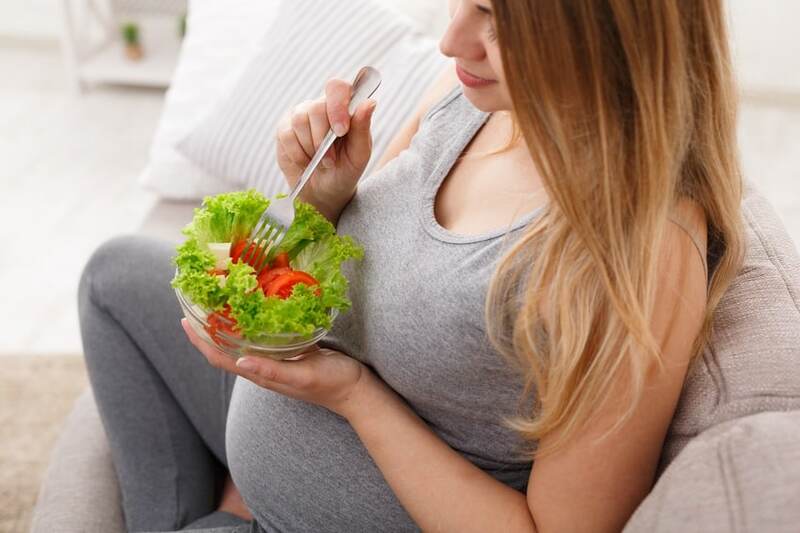 Zinc is a big one, because zinc levels naturally drop as you go through your pregnancy, so make sure you increase your zinc levels as you get further along. Aim for 30g of zinc a day. Meat is particularly high in zinc, as is seafood. Yoghurt and milk reduce your chances of preeclampsia, low birth weight, and early delivery. Nuts are a great source of magnesium, and considering how it affects your babies nervous systems as well as premature birth, it’s something you should be adding to your diet. DHA is an omega 3 fatty acid, and it’s found in fish, especially salmon. Linked to lower levels of neurological problems, higher IQ’s and higher birth weights, it’s worth stocking up. Low levels of iron affects the blood and impairs baby growth, especially important for twins, as well as increasing the chance of hypertension. Red meat, and strangely enough, healthy cereals, are really good for high levels of iron. Vitamin D. Vitamin D is huge. It increases blood flow specifically to the placenta, as well as calcium absorption, so your babies are going to be born with strong, healthy bones. Orange juice, or getting out into the sun, can help with this. So get outside, girls! You’re going to be drinking more water, too. This is really important, especially in the second half of your pregnancy, because dehydration can contribute to premature labor. Considering that you’re having twins and are at greater risk of premature birth anyway, you don’t want to do anything else to push it. So make sure you’re hydrated. Check your urine when you go to the bathroom, and if it’s dark or cloudy, make sure to drink more. It should be straw yellow or lighter, and see through like water. Remember, as long as you’re making healthy choices, you’re doing the right thing. Listen to your body, and talk to your doctor. If you need anything specific, they will let you know, so just do the best you can and listen to your body and it’s needs, and you’re sure to have a healthy, happy pregnancy. Hopefully you now know what to eat when pregnant with twins. Is there anything we’ve missed? Did you have incredible cravings for anything during your pregnancy? What were they, and how long did they last? Let everyone know in the comments, or by joining our online community. Who knows. Maybe you aren’t the only one!